If you have some time off in December for Christmas Holidays, have some friends in town, or are just here visiting, I would suggest getting out for some winter chinook fishing. It has been about a month now since the winter season really got rolling and so far, so good. In fact there have been some down right awesome days out there with good numbers of chinook coming back to the dock. Even on the slower days there has been decent action with smaller chinook to keep the rods bouncing and a few long line releases on bigger fish. To top it off, crabbing and prawning has also been productive. So if you want some fresh air or want to cure that cabin fever after all the rain, give us a call to book a winter chinook trip! If you are heading out on your own boat remember to keep your gear close to the bottom. We are often fishing in 100-250 feet of water, very close to bottom, so make sure you have lots of cable or braid on your rigger, at least 300 feet. Also try using 18 pound cannonballs instead of 15 pound cannonballs once you are down past 175 on the riggers. This will help keep your gear down in the zone when you are fishing deep and also helps when the tidal current is strong. Keep in mind the water is very clear this time of year so UV and glow flashers will work well. Generally when we are fishing 100-175 feet the UV flashers will work very well. Once you get down to 175-250 feet flashers with glow will start to produce better. The same can be said for spoons. When fishing shallower try non-glow spoons and once you get deep make sure the spoon has glow paint on it. You can also use anchovies in teaser heads, UV, or glow, but this time of year trolling fast with spoons and covering water tends to work as good or better than bait. It is also important to match the bait size and this time of year it is usually pretty small. That means small spoons like Gibbs’ Skinny G and Silver Horde’s Coho Killer. Below is a picture of some very productive flashers and spoons for winter chinook in our local waters. The first flasher on the left is the Salty Dawg. 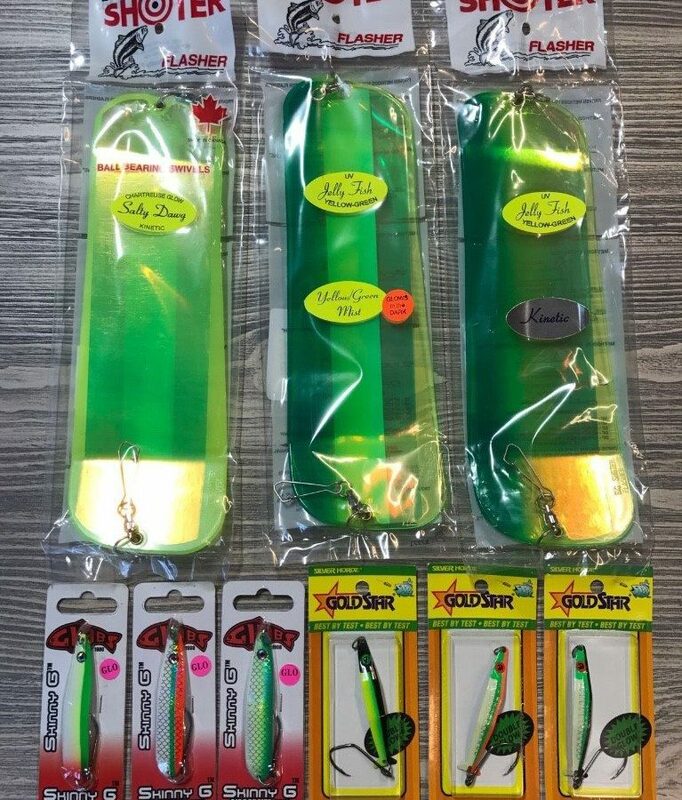 This flasher has a chartreuse glow blade with an extra piece of glow tape on one side and chartreuse reflective tape on the other side. This is an excellent choice when fishing deep. The flasher in the middle is the UV Jelly Fish Yellow Green Mist with a glow stripe, aka Club Dub Glow. This is a killer flasher without the glow stripe, but the glow stripe gives it a bit more pop when fishing 150-225. The flasher on the far right is the original UV Jelly Fish Yellow Green Mist, aka Club Dub. From the surface down to about 175 this is a go to flasher that has caught a lot of fish over the last few years. With these 3 flashers you will have all depths covered. Below the flashers are some go to Skinny G and Coho Killer spoons that represent the winter anchovies and herring very well. Give these flashers and spoons a try and you won’t be disappointed.